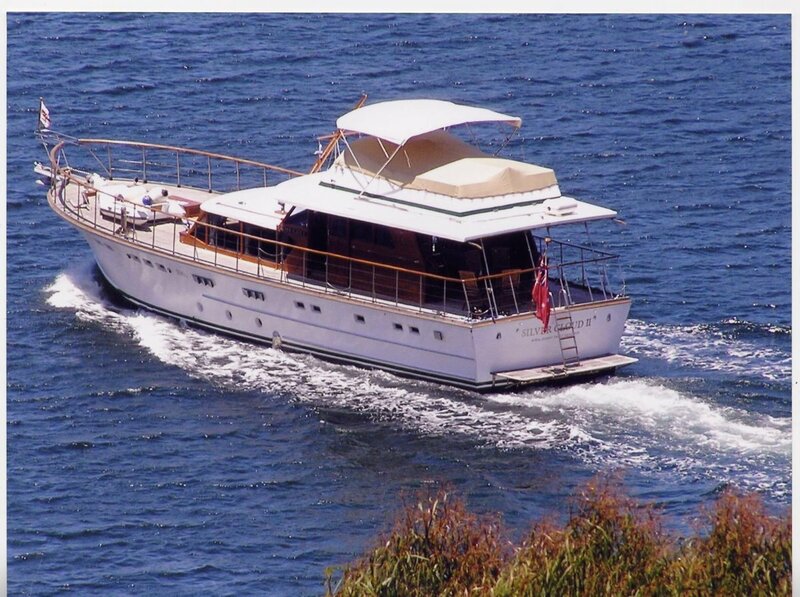 Timber The hull design is a V bottom, hard chine planing hull with a full length keel. The 'Silver Cloud II' is one of the rare jewels in the Halvorsen fleet - a famous and greatly admired cruiser which stands apart from other boats for real prestige and cachet. From the luxurious paneled cabins with plush Wilton carpets, to the green marble and teak bathrooms, or the gourmet stainless steel galley equipped with every convenience, 'Silver Cloud II' is perfect for luxury entertaining, lazing aboard or coastal cruising. Designed and engineered for easy maintenance and ease of handling, her split level layout offers privacy and comfort without sacrifice. Decks are laid teak, epoxy fastened to two layers of lightweight hardwood ply over Oregon deck beams. Margin boards and toe rails are solid teak. Twin Cummins NT 380 turbo charged diesels of 380 hp each, port engine recently rebuilt and the starboard engine fully rebuilt approx 1,200 hours ago.
) Twin Disc gearboxes 2:1 ratio with 2.5" stainless steel propeller shafts with four bladed bronze propellers (both recently removed and tuned). Forward guest cabin with twin single bunks, hanging locker, drawers and cupboards. Full latex mattresses recovered. Four portholes with overhead hatch. Ensuite head and shower. Crew cabin with single bunk and hanging/storage lockers and drawers. New mattress covered in Ultra Suede. Two portholes. Guest cabin amidships with twin bunks and latex matresses, twin hanging lockers, under bunk storage and dressing table with mirror. Two portholes. Guest head, shower with marble vanity, frameless glass shower screens. Owner's cabin with twin bunks (double and three quarter), wardrobe, dressing table, four portholes and escape hatch. Ensuite with head, shower and vanity. Custom made pure wool carpets over high quality wool underlay. Leather dashboards. Leather/ultra suede ceiling panels in pilothouse and dining saloon. Large dining table with six high back padded chairs. Custom plate/wine/linen storage cabinets. Ultra suede sofas in pilothouse with storage cabinet/side tables. Port & Starboard pilothouse side doors for easy access. Two aft doors opening to aft deck featuring a circular table and two storage lockers with cushions. Teak deck chairs with cushions. Crème leather helm chair has full 360 degree vision for ease of maneuvering. 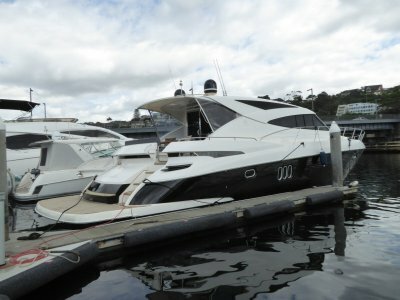 Three Raritan Atlantes vacuum/macerator marine toilets are fitted. Lectra San waste processing, holding tanks with macerator pump out, or direct discharge systems are variously fitted. TEAC 42" Plasma television in dining saloon connected to a Sony multi system DVD/Video player. Sony TV fitted in pilothouse. Kenwood AM/FM stereo with individual load CD player and iPod connection. Kenwood FM modulator 10 stack CD changer. 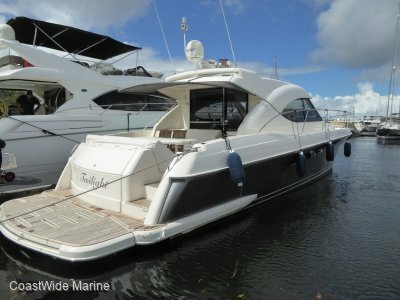 Stereo speakers (14) fitted to forward, guest, owner's cabins, dining saloon, pilothouse, aft deck and flying bridge, most with separate volume controls. The galley has SMEG ceramic hob electronic cook top. Ducted range hood with lights. SMEG 'Renzo Piano' stainless steel, fan forced oven. Whirlpool (Sweden) convection microwave. Two door stainless steel Eutectic refrigeration. Twin large capacity stainless steel freezer compartments. Main switchboard located in pilothouse has 24 & 240 volt systems all secured by circuit breakers. Engine and house batteries have main switches. 12 x 2 volt Marine Gel batteries give 500 amp hr house power. 4 x 6 volt marine Gel batteries are located in engine room for starting. The Onan has a 150 amp hr starting battery. Whispergen is connected to the house batteries and starts automatically when the capacity falls below 25% of maximum. Victron Phoenix Inverter/Charger/Shore Power Monitor operates all 240 volt systems excluding the HWS and hotplates/oven. Inverter is of 3000 watt capacity with a 6000watt overload. Battery charging is three stage with dual output of 70 amps and 15 amps for house and engine batteries respectively. Shore power is regulated to prevent overload. Inverter changeover is instantaneous. 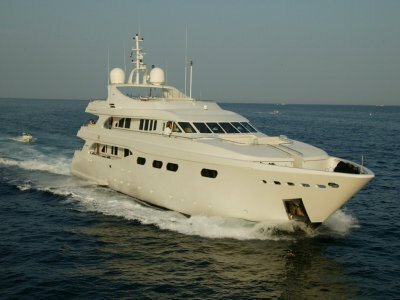 The Silver Cloud II operates as a 'silent ship' for most of time other than peak cooking periods. Furuno 48 mile radar with open array scanner (not fitted). Furuno GP 500 GPS navigation interfaced with Furuno FAP 55 Auto Pilot. ICOM VHF radio with full remote to flying bridge. Muir Thor Electric Anchor Winch with auto chain wash and dash mounted remote control and chain meter. Up/down remote fitted to flying bridge. Separate deck/anchor wash system on foredeck. Full storm covers and varnish covers. Two Bimini tops for forward and aft sections of the flying bridge. New flying bridge cushions in weather proof canvas. Other than the hand rails and cover boards, it is possible to wrap the boat in ten minutes offering a dramatic reduction in maintenance of the varnished timber. Large teak swimming platform with stainless swim ladder. History- Designed by Harvey Halvorsen and following the style of the famous Halvorsen 32 & 40 'Vikings', the first hull of this design was originally used for the Bass Straight oil rig tender 'Attunga' which carried crew and supplies to the various rigs in sometimes atrocious weather. Two further hulls were ordered and constructed, however the vagaries of Bass Straight caused a rethink and a change to helicopters. 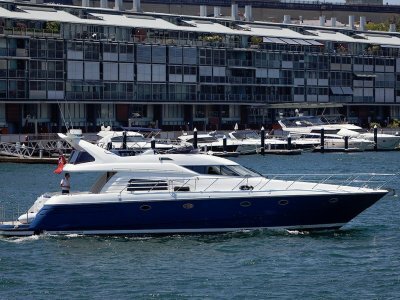 The two hulls were then designed with motor yacht layouts and were to become the 'Kanahoee' & 'Banyandah' built for brothers Les & Ron O'Neill. 'Kanahoee' was to become the glamour girl of Sydney Harbour, one of the largest and most luxurious privately owned cruisers afloat, her sistership having traveled to Perth.